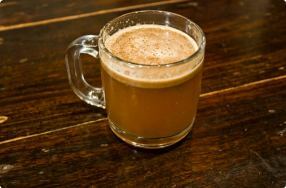 Watch as Robbie shows a thirsty crowd at the Cleveland Food Show how to prepare a hot buttered rum! Flambe – a cooking procedure in which alcohol is added to a hot pan to create a burst of flame. Cras condimentum a elit eget sagittis. Ut dignissim sapien feugiat purus tristique, vitae aliquet arcu tempor. Nulla facilisi. Integer maximus mi non nulla posuere consectetur. Phasellus erat lectus, ullamcorper nec erat vel, hendrerit hendrerit urna.